As I write this review, spring is technically only a few hours away, but you would never know it if you were to look out my window. There is significant snow on the ground and Father Winter, at least on the East Coast, demonstrated that he is still a force with which to contend. Snow storm Stella came roaring through New York last week with all of the force of Marlon Brando yelling..."Stella!!!" (Sorry - like many others, I couldn't resist). So once again, amidst the deep winter chill, the warm, elegant environment of the Café Carlyle beckons. Famed singer Suzanne Vega, who rose to prominence in the mid-1980s, made her Carlyle debut last week, and based on what I heard it was a debut that was long overdue. Vega joked at the beginning of her performance that when she went to hear singers that had been around for a while, she preferred to hear the songs that made them famous rather than new material. Her set list blended well known songs from her 1987 album Solitude Standing ("Luka" and "Tom's Diner") with numbers from her recently released CD, Lover, Beloved: Songs from an Evening with Carson McCullers. The songs for Lover, Beloved were written with Duncan Sheik, the composer of the score for the Broadway hit Spring Awakening, and are part of a new musical about McCullers' life which will debut in Houston next Valentine's Day. The lyrics for "New York Is My Destination" and "Harper Lee" I found particularly clever. As per her immediate predecessor at the Carlyle, Joan Osborne, Vega is a performer who inhabits both the music and lyrics. This lady really knows how to deliver a song, or more accurately how to sing and act a song. Emphasizing the acting aspect, she alternates props of a top hat and a cigarette (unlit, of of course). The cigarette is held during the McCullers portion of the evening. Carson was precocious both physically and intellectually, publishing her most acclaimed work The Heart is a Lonely Hunter at the age of 22 and reaching the height of five-feet eight inches by the age of 13. The smoking was apparently used by McCullers in an attempt to stunt her growth. On the night I attended, Vega clearly had some serious fans in the audience and they didn't seem disappointed. After her first number, several yelled out, "You're terrific!" and "You're marvelous!" This was followed by mid-performance exclamations of "You rock!" and "You make me feel better!" which I suppose at the end of the day is what all good artists should do. Though small in numbers, her two member band (Jason Hart and Gerry Leonard) provided rich accompaniment playing a variety of instruments. I have to admit that I wasn't all that familiar with Vega's singing before I attended the show, but I found her performance captivating, with a definite combination of musicality, sophistication and intelligence. She had a fairly extensive set, but it seemed to go by quickly - the clear sign that you are having a good time. When her last scheduled song was sung I was disappointed the performance was over. The audience must have felt the same way because when Vega asked, "Would you like to hear one more," the crowd roared back, "Yes!" 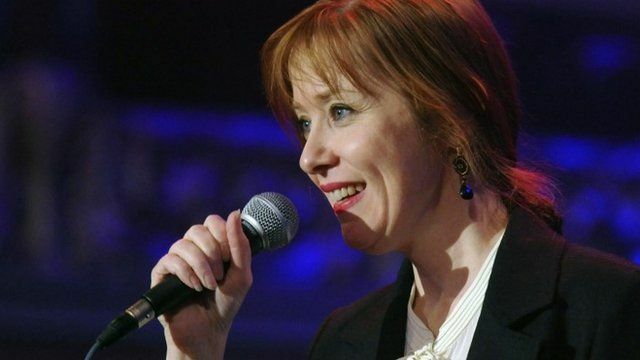 Suzanne Vega will be appearing at the Carlyle through March 25. Upcoming engagements at the Café include John O'Hurley who, in addition to winning a season of Dancing with the Stars, played J. Peterman on Seinfeld. His show, entitled A Man With Standards, will feature songs from The Great American Songbook as well a reflections on his varied entertainment career. O'Hurley will be appearing at the Café from March 28-April 8. Precocious and celebrated singer Jackie Evancho will be making her Café Carlyle debut April 11-22. Still only in her teens, she has already had a very successful vocal career, appearing at age 10 on America's Got Talent. She has had six consecutive number one albums on the Billboard Classical charts, with sales of over 2.5 million albums in the United States alone, in addition to performing for President and Michelle Obama, as well as other luminaries. And for jazz enthusiasts, Woody Allen appears at the Carlyle every Monday evening through June 19 with the Eddy Davis New Orleans Jazz Band. The food is excellent, breakfast unbeatable, the orange juice is the best I have regularly had, coffee is excellent and service is more fast, efficient and friendly. http://www.makemyessay.com/ The staff continually tops up your coffee as strong. The restaurant environment is also warm & inviting. The restrooms are a bit grungy, but another than that, this is the best restaurant in the city, and I have tried most of them.